Orchin, Milton - Component of : Early Ideas in the History of Quantum Chemistry. Photo from Orchin's 2001 Faculty page. Milton Orchin was born in 1914 in Barnesboro, PA, USA. B.S., Ohio State University, 1936. M.S., Ohio State University, 1937. Ph.D., Ohio State University, 1939. Professor of Organic Chemistry at Cincinnati from 1953-1981. Hon. Doctor Sciences, University of Cincinnati, 1983. PS: Try a click on either one of the "spectra". 1914            Born in Barnesboro, Pennsylvania on 4 June. and Fellow, Ohio State University (until 1939). 1937            M.S. Degree in Chemistry, Ohio State University. and Drug Administration in Cincinnati, OH. Department of Agriculture in Beltsville, MD. United Stated Bureau of Mines in Bruceton, PA.
1947            Guggenheim Fellow, Sieff Institute, Israel. 1954            Consultant for Houdry Process and Chemical Company. of Cincinnati; Consultant for William S. Merrell Company. Board of the Journal of Organic Chemistry (until 1963). 1958            Member of Nomenclature Committee, ACS (until 1963). Consultant for M.W. Kellogg Company. (until 1970); Chair, Cincinnati Section of the ACS. for Standard Oil of Ohio (later Sohio, now British Petroleum). 1964            Consultant for Philco Corporation. Directors, American Civil Liberties Union (until 1973). the University of Cincinnati Board of Directors. Graduate School, University of Cincinnati. Cincinnati Faculty Council on Jewish Affairs. 1974            Consultant for Allied Chemical Corporation. 1976            Distinguished Scientist Award, Technical Societies of Cincinnati. Consultant for Brookhaven National Laboratories. 1979            Visiting Professor, Ben Gurion University of the Negev. ACS; Consultant for Standard Oil of Ohio. 1982            Consultant for Sun 0il Company. D.Sc. Degree, University of Cincinnati. 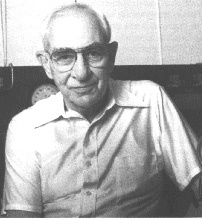 1999            Director of the Hoke S. Greene Laboratory of Catalysis (since 1971). Copyright © Mar. 3, 2002 by U. Anders, Ph.D.